The bird-inspired Leonardo drone relies on a pair of thrusters to help it keep its feet. Developed by a team from the California Institute of Technology, the Leonardo (Leg ON Aerial Robotic DrOne) was designed to navigate rough, uneven terrain. 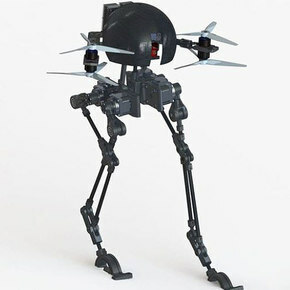 As the drone walks on its pair of legs, the thrusters enhance performance by balancing the upper body and allowing the drone to make ‘more agile motions.’ The thrusters also allow the Leonardo to fly for short distances as well as jump—another advantage when traversing uneven terrain, such as during rescue missions or on other planets.